America might have more than enough fuel underground to stay warm this winter—a realization that could make some investors in natural gas break cold sweat. Thursday’s weekly report on supply-demand of gas released by the US Energy Information Administration showed the deficit versus last year’s reserves was at 7 percent now compared to 20 percent a month ago. 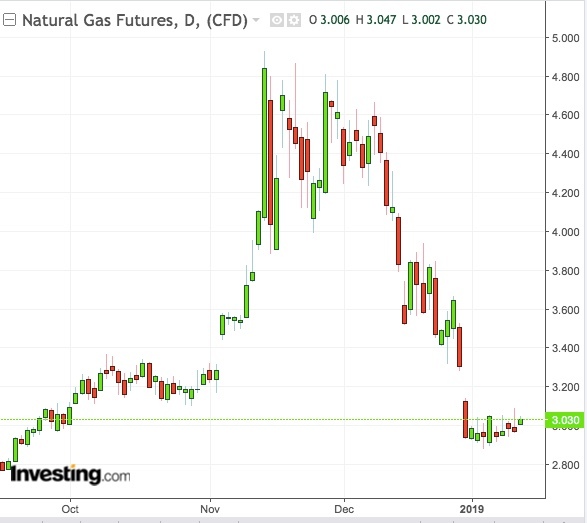 That was after last week’s gas drawdown for heating came in at 91 billion cubic feet versus the five-year average of 187 bcf for this time of year and the gigantic 359 bcf withdrawal a year ago. Reuters reported that for last week, there were 174 heating degree days, compared with 283 HDDs in the same week a year ago and a 30-year normal of 229 HDDs for the period. HDDs measure the number of degrees a day's average temperature is below 65 degrees Fahrenheit (18 degrees Celsius). The measure is used to estimate demand to heat homes and businesses.